Sambong is found throughout the Philippines, and grows wild on Mt. Banahaw. Doctors in the Philippines prescribe Sambong for the dissolution of kidney stones. 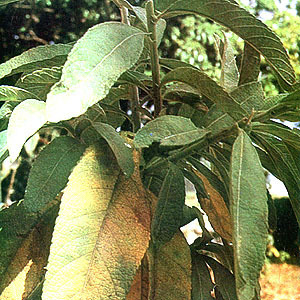 The leaves of Sambong are used as a tea in the Philippines, and as a cure for colds. It is also said to have antidiarrhetic and antigastralgic properties. It is also used as an expectorant. It is given for worms and dysentery. It is one of the most common used medicinal herbs in the Philippines. Leaves used also as flavoring ingredient. Decoction of roots and leaves for fevers, kidney stones, and cystitis. Decoction of leaves used to induced diuresis for purpose of treating kidney stones. Used in upper and lower respiratory tract affections like sinusitis, asthmatic bronchitis, influenza. Applied while hot over the sinuses. Used for wounds and cuts. Leaves as poultice for abscesses. Fresh juice of leaves to wounds and cuts. Poultice of leaves applied to the forehead for relief of headaches. In Chinese and Thai medicine, leaves used for treatment of septic wounds and other infections. Sitz-bath of boiled leaves, 500 gms to a gallong of water, for rheumatic pains of waist and back. Tea is used for colds and as an expectorant; likewise, has antispasmodic and antidiarrheal benefits. In Vietnam, decoction of fresh leaves used for cough and influenza or as inhalation of vapour from boiling of leaves. In Thailand, dried leaves are chopped, made into cigarettes and smoked for treating sinusitis. For fever, leaves boiled and when lukewarm used as sponge bath. Decoction of roots used for fever. In SE Asia widely used for various women problems. Postpartum, leaves are used in hot fomentation over the uterus to induce rapid involution. Also used for menorrhagia, dysmenorrhea, functional uterine bleeding and leucorrhea. Decoction of roots and leaves used for rheumatism and arthritis; also used for treatment of post-partum joint pains. Decoction of leaves, 50 gms to a pint of boiling water, 4 glasses daily, for stomach pains. Poultice of fresh leaves applied to affected joint. A sitz-bath of boiled leaves used in the treatment of lumbago and sciatica. This entry was posted in List of Medicinal Plants in the Philippines and tagged sambong on March 30, 2009 by Pinoy Herbs. Discover herbal supplements that can help you live a longer, healthier and more youthful existence.Explore various natural herbs that may help you lose weight naturally without harming your body.Find herbal remedies that can stabilize or reverse the progression of many health disorders and diseases. I use it in my research proposal,, Thank’s!!! I would like to ask where to find/purchase those leaves here in Manila? We are really in need of that plant. Thank you very much! Sambong, as an indigenous medicinal plants can be easily grown in pots for those living in urban areas where there is no available lot. Try it! So that you can have an all-year-round supply of its leaves. We need a reliable Sambong capsule manufacturer to supply bulk Sambong capsules to Davao Del Sur at the right price.